While the must-haves may change — from spacehoppers to tamagotchis to Hatchimals and back again — there are a few classic options for kids’ toys and games that remain timeless, and with very good reason. The best children’s board games have either resisted the ravages of time, coming out in a new form every Christmas until they’ve more incarnations than Doctor Who, or done something to shake up the genre, and our list of the best games of 2017 has a little bit of both. What you choose and how you play it is up to you (within reason, of course, those instructions are there for a reason), but there are some practical concerns to think about, which is why each of our picks comes with guidelines for age appropriateness and number of players. No-one knows your child better than you do, so if they’re just under the lower age limit but you think they can handle the academic rigours or breakneck speed of some of the games for older kids, go ahead. All of our choices are completely suitable games for kids of all ages, but word or logic games intended for preteens may prove a bit challenging if they’re still in Key Stage 1. Most of our picks can be played with two people or more, and one can even be played solo, so they’re great for down-time any time, no need to wait for big gatherings. Plus, board games and card games always make a great affordable gift, with asking prices just peeking into double figures. So what’s not to love? Keep reading for our round-up of the best board games, card games and crowd-pleasing party games for kids this year. 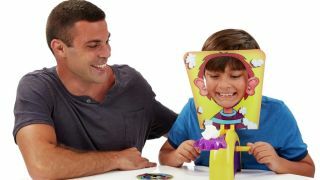 Like a dessert-based, kid-friendly version of Russian Roulette, Pie Face is a laugh (or fearful squeal) a minute. There’s not that much to it really, but that’s where its charm lies, because it’s simple and enjoyable enough that even the smallest members of the family can get involved. Just spin the spinner, crank the handle the number of times indicated, and hope you don’t get a handful of whipped cream or a wet sponge to the face. Just try to ignore how pleased they are to see you shamed-faced and dressed up like a trifle, for the sake of your sanity, and it’s great, messy fun for all. While this fast-paced card game is nowhere near as violent as its name suggests, it’s more than enough to set the pulse racing. The premise is simple: every player draws a card in turn, and if that card is an exploding kitten, they’re out of the game. Along the way, you’ll find cards that’ll let you peek at what’s coming up in an attempt to save yourself from explosion (in other words, curiosity saves the cat). It’s remarkably easy to learn, but immersive at the same time, so it’s just the thing to capture older kids’ attentions and imaginations. We all know that kids love learning stuff, but mostly, they love knowing stuff. Dinkee, the little sibling of grown-up party game Linkee, gives them the chance to show off their logic skills by getting them to answer four simple questions and figure out what links them all together. Once they have, they get to shout out (another of their favourite things) the magic phrase “Dinkee!”, and if they’re right, they win the card. With 800 questions to answer and a brain-training element, it’s hours and hours of fun in which they won’t even realise they’re learning, and isn’t that the best kind? With property as with Pokémon, the goal is simple: gotta catch ‘em all! This Pokémon-themed twist on the original Monopoly keeps it fresh and accessible for younger children, giving them an easy reference point for play and sparing them the pain of having to pronounce “Marylebone”. That the board gives you the opportunity to snap up real estate in the original Kanto region is a nice touch for anyone who’s yet to relinquish their original Gameboy, and avoiding the newest releases means it’s not going to be out of date in a few months. Plus, they can play as their favourite classic pocket monster (cue lots of squealing and growling for extra fun), which, let’s face it, is way more fun than being a top hat or an iron. We all know it, we all love it, and some of us might even have sets of our own still taking up space in our parents’ attics (sorry Dad). But even old faithful Mouse Trap has had a bit of a facelift, with its box promising exciting new gameplay, including more ways than ever to get caught, and an easier setup. Some things never change though, like the satisfaction of setting up the complex mouse trap, or the anticipation of watching that little ball. All in all, it’s still great, timeless fun that’ll inspire intense concentration. On the face of it, Pass the Bomb sounds like a walk in the park. Just take the card, say a word that includes the letters on the card, and pass it on. Easy, right? WRONG. Despite this timed card game being suitable for anyone over 9 years of age, it’s enough to test the mettle of even the most seasoned word game veterans, with a ticking electric bomb that jangles the nerves and makes your mind go completely blank. It’s enormous fun, and a great vocabulary builder for kids and adults alike, but you might want a drink of something strong afterwards. This kids’ version of Articulate is compatible with the adult version, so if you already have a one kicking around, you can put them together to form one gigantic mega-set for family game night. Even if you don’t, this game’s a riot. Putting your child’s descriptive and lateral thinking skills (as well as your own) to the test in the name of points is not only hilarious but educational, teaching them to think and express themselves in increasingly creative ways. For fast and furious fun with a learning element, this is a great buy. Testing the same rhythm and hand-eye coordination skills as adventure video games, but without the added screen time, Fantastic Gymnastics is a great way to get the family together in friendly competition. Like many of the games on our list, the premise is easy peasy: simply get the gymnast to land on the mat, but sticking the perfect landing is harder than it looks, and adult reviewers commented that they found themselves surprisingly sucked in. Also, we know this is a children’s board game list, but it’s worth mentioning that some clever clogs reviewers recommended turning this into a simple but devastating drinking game — proceed with caution. Not quite at the board game age yet? Check out our round-up of the best sensory toys for little ones to keep the smaller children entertained too.